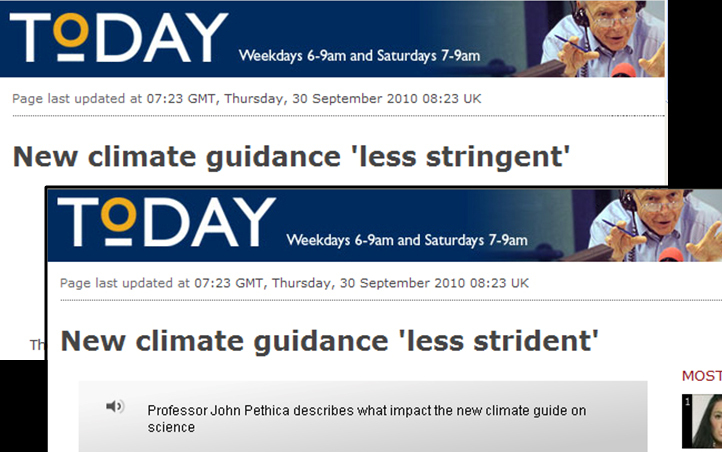 Whilst listening to the Today programme (Radio 4, September 30th 2010) I heard a very interesting piece about the ongoing debate about “Climategate” and dogmatism about climate change. Going later to their Listen again site to bookmark the story on my Delicious account, I noted that the headline didn’t seem to match the sentiment I’d got from the package. This was confirmed when I played the audio – a web editor had mistaken “less strident” for “less stringent” – which gives the report a whole different spin. I alerted Tom Feilden (you can email anyone at the BBC via firstname.surname@bbc.co.uk) and he had the title corrected.